This week, E - a 5 year old self-identified fairy - has specified that she would like a Rapunzel cake for her 6th birthday. Have I mentioned that I like a challenge when it comes to decorating cakes? In previous years I have made cakes for E themed on Dora the Explorer, a large pink castle, and a general dolly varden cake. As well as this I have made Bob the Builder cake and a Yoda cake for my son. I have been experimenting with an icing tip which is designed for grass and hair effects - it has many small holes at the tip, and so I am challenging myself to make some cartoon-realistic hair for Rapunzel. This involves extruding a continuous length of hair from the icing bag - no joins will be possible! This hair will be layered on top of a dolls existing hair, and then extended and draped about to show how long Rapunzel's hair is. 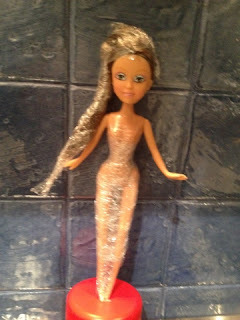 This afternoon E and I had a play with a few dolls to see which one would be most suited to going into the cake, and after selecting one, we dressed her in glad-wrap to protect her from becoming sticky, and to protect our party guests from anything toxic in the plastic. Making a child's cake always leaves me in a quandary. Fondant looks spectacular, but no-one in their right mind likes eating the stuff, yet butter cream tastes great, but is much harder to work with when modelling specific shapes. Butter cream is the icing which children lick off their piece of cake, and then abandon that bit of cake while they run off and play. I shall be posting updates as the cake progresses. Meanwhile, E, X and I saw the latest Disney/Pixar movie "Brave" on Friday evening. It is the tale of a princess, and it's an absolute cracker of a story! Set in Scotland in the time when big grizzly bears roamed the land, it's a story of balancing personal choice with tradition, gender roles, family responsibility, and the way things are. Naturally it is a journey of self discovery for our heroine Merida, who is a headstrong lass with a talent for archery. She takes us on a journey of outsmarting one's parents, consulting witches, and following Will O' The Wisps through Scottish highland forests before bringing us to the inevitable happy ending. A movie which I recommend to anyone as great entertainment, and due to the girls-can-do-anything message it's compulsory viewing if you have a young daughter. Miss E having a chat with Princess Bella. In front of the DVDs. 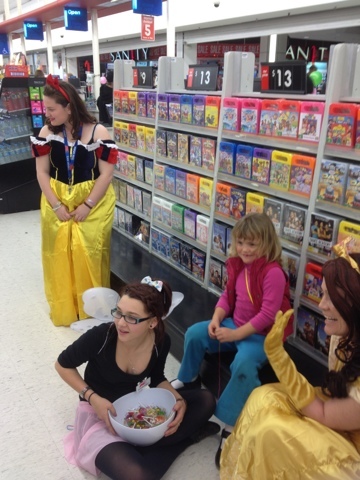 After the movie, we dropped in to Kmart to find a number of real-life princesses! We found Snow White, Princess Bella, a few fairies, Ariel, Cinderella, and some suited people supposedly from Men-in-Black. All working as check-out chicks (None of the register-roosters were costumed up). You know the global financial crisis (GFC) has had an impact when princesses and fairies go and get jobs behind cash registers. the small crowd which have gathered before them at Kmart Tuggeranong. That aside, Miss E was highly impressed in encountering royalty. 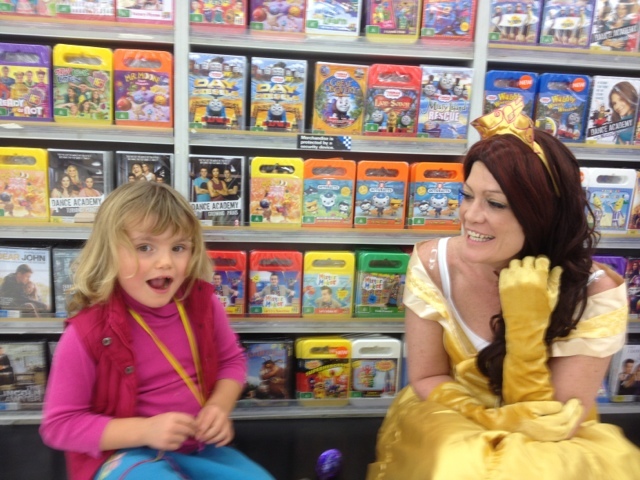 She must have made an impression because Cinderella, Princess Bella, and a fairy all took time out to chat to her. The hot topic for E was that her birthday is coming up soon, and that her world is well and truly alive with princesses, castles, fairies, and all that is pink and frilly. It certainly was an eventful evening!